The Purpose: In 1984 the Old Providence Associate Reformed Presbyterian Church, as a part of its ministry to its members and to the community, established The Old Providence PreSchool. The purpose of the PreSchool is to provide an education for children in a Christian environment in order to help prepare them for their enrollment in the formal education system. The Old Providence PreSchool Committee operates this ministry under the authority and supervision of the Session of Old Providence Associate Reformed Presbyterian Church. 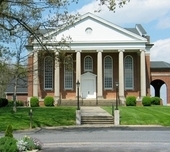 The Facilities: The PreSchool uses the facilities and grounds of Old Providence Church in the Spottswood Community of Augusta County, Virginia. Our classroom is located on the main level of Providence Hall, the educational and fellowship building of Old Providence. The playground area and parking lot are used for outdoor activities. The Employees: This program is a ministry of the Church. Therefore, all employees are required to be evangelical Christians, who are active members of a church; and who are committed to, and practice a Christian lifestyle and who are able and willing to teach from a Christian perspective. Because we desire the highest quality of teaching for the children, the teacher will have a Bachelors Degree in Early Childhood Education, Elementary Education or a related field. The Program: The PreSchool provides classes for three and four year-old-students. The Four-Year-Old Class meets on Monday, Wednesday, and Friday from 9:00 am until 12:00 Noon. The Three- Year-Old Class meets on Tuesday and Thursday from 9:00 a.m. until 12:00 Noon. A maximum of 10 students will be enrolled in the Four-Year-Old Class and a maximum of 10 students will be enrolled in the Three-Year-Old class. Classroom activities include the teaching of Biblical truth; academic exercises involving the alphabet, numbers, shapes, colors, etc. ; the teaching of life awareness skills such as the calendar, weather, etc. ; practice in social and classroom skills; and opportunity for free and directed play. Admission: When you make application for enrollment in the PreSchool Program, you are enrolling your child for the full school year. The PreSchool builds its plans for the year and its budget on your child’s participation from September through May. If you accept an enrollment offer from the PreSchool, you commit your child to regular attendance and yourself to meet the financial obligations of the yearly tuition. 1. be 3 years old by September 30th. the training and size of its staff. In order to apply for admission of your child in The Old Providence PreSchool, you must submit the following items to Old Providence PreSchool, 1005 Spottswood Road, Steeles Tavern, VA 24476. 1. The completed Registration Form. 2. The completed Information Form. offered admission). This fee is waived for church members. should be returned as soon as possible. * Monthly payments of $90.00 by the 1st of the month. * Monthly payments of $70.00 by the 1st of the month. If two or more children from the same household are enrolled in PreSchool, a $5.00 per month discount will be given on the total month's tuition. A limited amount of financial aid may be available to students with very significant need. For information contact the PreSchool Chairman, Robyn Smith. The School Year: The School Year opens with an evening Open House and Orientation in August. We normally operate from Labor Day to Memorial Day. The first day of class is Tuesday, September 3, 2019, for the Three-Year-Old Class, and Wednesday, September 4, 2019 for the Four-Year-Old Class. If you desire further information about Old Providence PreSchool, please email adminassist@oldprovidencechurch.org or call Robyn Smith at 540-377-5089, or call the church office at 540-377-2911. Registration for 2019-2020 is in process.